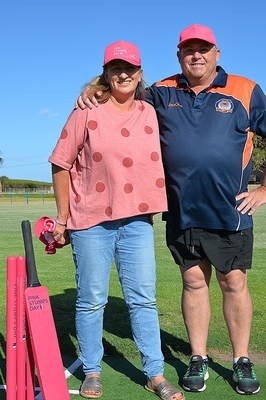 Collendina Cricket Club president Wayne Blyth and Pink Day event organiser Kate Every in the middle of Cobras members looking forward to their inaugural McGrath Foundation fundraiser. Collendina Cricket Club is gearing up for its second annual McGrath Foundation Pink Stumps Day. 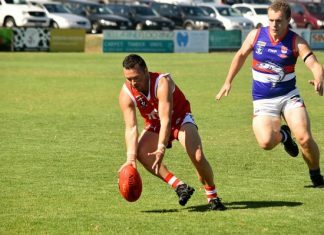 The inaugural Collendina Cricket Club Pink Stumps Day last year raised $3000 and the Cobras are hopeful the McGrath Foundation fundraiser will better its 2018 total. “The money (we) raise goes directly to the McGrath Foundation, so this is an easy cause to support,” said Kate Every, the club’s event organiser and an oncology nurse at Barwon Health’s Andrew Love Centre. “As an oncology nurse I see first-hand the fantastic work of our local McGrath (Breast Care) nurses Michelle Edwards and Sue Bowles,” Kate said. “Michelle (Edwards) will be attending our Pink Stumps Day and is giving us an insight on the role as a nurse. The day begins with all Cobra cricketers, including juniors, wearing pink to acknowledge the cause. Cobra Pink Day continues at the club from 3pm to 6pm on Saturday 16 February. “Entry includes finger food, complementary drink on arrival and live music by the talented Jess Elwood and crew,” the club said. More information is available by emailing Kate at kdevery@optusnet.com.au. Meanwhile, Ocean Grove Cricket Club has cancelled its own Pink Day fundraiser for this year.